A.V. 'Mac' Macan - father of the 'golden age' of West Coast golf architecture! A.V. 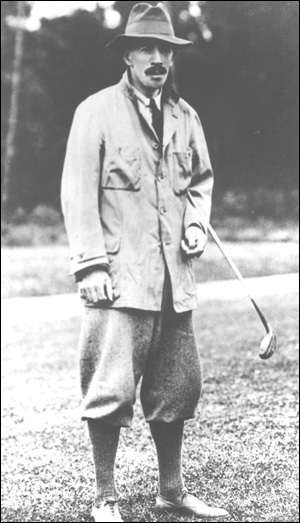 Macan revolutionized golf architecture in the Pacific Northwest over a career which spanned five decades beginning pre-World War I. Working almost exclusively throughout the Pacific Northwest, Macan's pioneering efforts are reflected in nearly 43 golf courses. He was born in 1882 in Dublin Ireland to an established family who lived right beside Oscar Wilde. His father was knighted for service to the medical profession. Vernon learned to play golf early on the links of Ireland but no one else in his family played the game. At first he was not very good. His initial recorded score was 96, (for the Navan golf team in 1906). However he was a determined young man. With coaching and competition, Macan quickly lowered his handicap from 31 to 6 - the upper limit for his entry into the Irish Championships. Because the profession of golf 'meant a drop in status below that of a paperhanger', Vernon decided to become a lawyer - a profession which (not coincidentally), contained a great many golfers. When his father died, Macan's inheritance made him a wealthy socialite and eligible batchelor. He now had the funds and the handicap to participate in the British Amateur Championships (1909-1911). He purchased a home and played at the prestigious Greystones GC where he shot the course record of 69. He went on to play virtually all of the major courses in Ireland and many in Britain. He studied them as he played. He was a student of course architecture during the golden age golf in Ireland, when from 1892- 1915 more than 200 courses opened. Willie Park and John Low, who outlined the first strategic principles for golf course design, ('Concerning Golf, 1903'), became Macan's mentors. Macan saw first-hand the construction of Irish courses with these new principles. In 1908, 'Mac' emigrated to Canada. By 1910 he lived in Victoria, joined the Victoria Golf Club, and soon made his presence felt by winning the B.C. Amateur in 1912 & 1913. In 1913 he also won the Pacific Northwest Amateur and the Washington State Amateur Championships. His arrival on the west coast began the (almost single-handed) golden age of golf course expansion in the Pacific Northwest. Armed with tireless energy and modern course design principles developed from the original Irish masters, Macan set the standard for golf course architecture for the next forty years. He was not known as the best businessman. He wanted to build the best course for each property and insisted on being 'hands on' during construction and operating free from all member interference. His principles for course design stand to this day. He was ahead of his time. Above all, he believed that skilled player should be challenged and rewarded by successful execution in the face of risk but also that golf was for everyone - that the middle and high handicapper must be encouraged to go out and have an enjoyable day. "It is in designing courses that are fine test and at the same time are full of character and originality, to say nothing of possessing the qualities that make them breed fun and enjoyment, that the art of modern course architecture reaches its highest point." He was a busy man but he continued to play golf. It is a notable statement of his character and resolve, that despite losing his left leg below the knee in the First World War, 'Mac' played golf for many years to a 4-handicap. He was regarded as one of the purest strikers of the golf ball. In 1964, at the age of 82, A.V. Macan succumbed to a heart attack while hard at work redesigning the Sunland Golf Course in Sequim, Wa. During his lifetime Macan's talent and integrity were recognized as he became the first Canadian member of the American Society of Golf Architects.